I am one lucky duck that my job allows me to work from home on occasion. With the natural light to uplift my mood and some good old-fashioned classic rock softly thumping in the background (smoke on the waaaahta, fire in the sky . . .), it lends to a productive environment. Until the cat shows up. 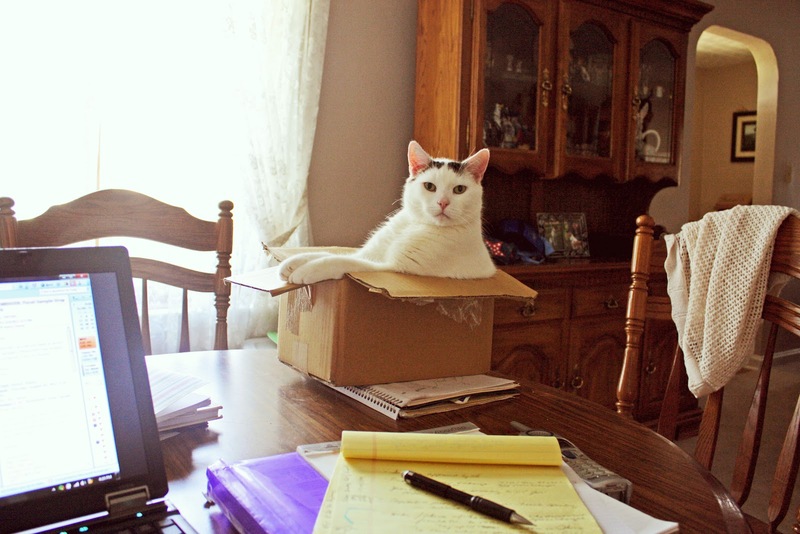 After he's leapt onto the table to tip my coffee mug, Bodine settles his furry mass comfortably on my documents. Rather absent-mindedly, he bats about my pen with a lazy paw and asks, so whatcha doin'? Please don't think less of me when I tell you that I had to set up a trap. The cat left me no choice, you see. It's the only thing that will contain him effectively. The Cardboard Box Cat Trap. He looks mighty comfy in that trap!!! And he is. I'm thinking about trying a clear plastic tub so I can see how he actually fits his furry mass in that small space. How many buns in the oven?